“Whooooooooo whooooo!” Admit it, there’s some train love in all of us. I first realized my love of trains when I was a little kid, in the years following the great interstate highway build out, when it was pretty well decided that the long haul trucker had made the train obsolete. Whenever my family went for a drive it seemed like we always passed train graveyards. To me, it was the most amazing thing I’d ever seen – what were all the different types of trains and street cars used for, where had they traveled, what would it be like to own one to play in? The train thing stuck with me – my favorite movie in those days was “The Bridge on the River Kwai” – at least until they (spoiler alert) blew up the railroad bridge, and the train. I had electric train sets, first Lionel, and then HO. When I got older, I put pennies on the nearby railroad tracks for the passing trains to flatten (since that was the “don’t ask, don’t tell” era of child rearing, my mother never knew I was playing on the railroad tracks). I would wander the town, hunting for the mythical tracks of the John Bull (the first locomotive in the United States), which were rumored to still exist somewhere in the neighborhood. And the first record I ever owned, a flea-market bought 78 RPM entitled “Train Sounds”, consisted solely of the conductor’s call (“Track 5 for…Anaheim…Azusa…and Cuuuuuuuu-camonga!”), followed by the “whooooooooo whooooo!” of the train whistle, and then 3-1/2 minutes of the chug-chug-chugging of the locomotive. I think a lot of engineer engineers (this type of engineer) started their young lives wanting to be that other type of engineer. And I think it is with a little bit of secret remorse that a lot of engineers have to occasionally explain that they don’t drive a train, they are not that type of engineer. So what got me thinking about trains? To tell the truth it was a recent trip I made to New York City. When I lived in New York in the 70’s and 80’s, I was always intrigued by the abundance of crumbling and abandoned infrastructure of the city. Bridges that suddenly ended in drop-offs blocked by barricades were interesting enough, but to this reformed engineer (that type of engineer) the abandoned elevated railroad that wended its way through the west side of lower Manhattan – and actually through many of the buildings — was really something. Often I wished I could explore that abandoned railroad line. Well today I (and everybody else) can do just that, as that railroad has been turned into a city park. This park, called the High Line, runs, 2-3 stories above ground, 1.5 miles between Gansevoort and W 34th Streets. So how did the High Line get here? Before the obligatory engineering (this type of engineering) chatter, first a little history is in order. In the 19th and early 20th century, the lifeblood of a major city like New York was its trains: on the east side of Manhattan commuters poured down Park Avenue on New York Central’s lines; on the west side the trains hauled freight down 10th Avenue to the meatpacking district and beyond to the factories and warehouses of the lower west side. As the city became more crowded, the trains, which ran on grade, became more and more dangerous. The answer on the east side, decided after a major train/car collision killed 15 in 1902, was to go underground – tunnels were dug for the trains leading into a brand new, multi-level Grand Central Station. 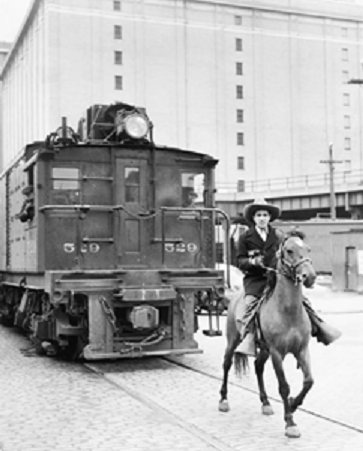 On the west side the status quo held –trains continued to rely on “West Side Cowboys”, required by law, riding in front warning pedestrians about the oncoming trains. Eventually things got so bad on 10th Avenue that the trains had to go. It was decided to both elevate the lines onto a viaduct and to move those lines to the interior of the city blocks, so that the trains could run directly through the buildings that they served. This was an ingenious decision: not only were the streets spared the noisy, dangerous train traffic, but freight unloading could be done inside the warehouses — much more efficiently and with less theft. The High Line railroad opened for business in 1934. But times changed, New York’s west side became less industrial, and trucks replaced trains. Traffic on the High Line declined, the last train ran in 1980, and the line became abandoned, overgrown with graffiti and weeds. In the 1990s discussion began on what to do with the abandoned eyesore – one camp proposed demolition, the other campaigned to turn it into an urban park. In 2006, the latter faction prevailed and the park project was begun, with the railroad viaduct repurposed as an urban trail: it had varied landscaping and eclectic art, as well as amenities such as benches, a snack bar, and an amphitheater providing a great view of 10th Avenue. Today thousands of people walk there, high above the streets, between and through the buildings of New York City, and, in many places along the trail, along the old railroad tracks themselves. So how does the engineering (this type of engineering) fit in? One thing that fascinated me while walking the High Line was the way that so much structural work was done to the park, while maintaining the original character of the railroad line. I had to find out who was behind it. The article details the way the engineers first had to remediate existing damage to the viaduct by means such as bolting plates to the girder webs and double angles to the flanges where corrosion or other damage was excessive. Then the existing structure had to be adapted to new architectural installations, such as stairways for access from the street. When members were cut away to make room for stairways, riveted ends were often left in place, for both stability and esthetic reasons. 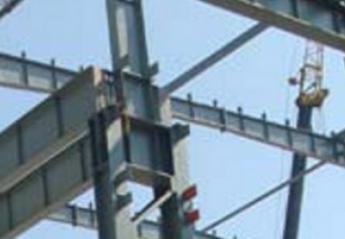 Where a newly installed elevator caused a critical girder to be cut through, the elevator framing was strengthened sufficiently to serve as the support needed to pass the load to the ground below. Thermal expansion was handled by installing complex expansion joints every 138 feet along the pathway. And finally, when the architectural design called for a picture window to be cut through a 10-foot deep girder in order to create the 10th Avenue viewing amphitheater, the engineers found a way to counteract the loss of the missing web. Whenever I go to New York I try to get to the High Line – it’s a great combination of art, flora, the energy of the street from three stories up, the New York skyline – and trains — and engineering. While walking down the trail, I sometimes catch myself with a “whooooooooo whooooo!” under my breath – and the thought that maybe it is possible to be both that kind of engineer and this kind of engineer. Planning on building your own urban trail? Or just a railroad viaduct? Why not use www.cloudcalc.com, Structural Analysis on the Cloud. Easy to use, no software to download, and free of charge!